Joseph Pisani is the son of a stonecutter and began his career as a stonecutter’s assistant and memorial designer. He also is an illustrator, a painter (oil, watercolor, acrylics), a sculptor, and a designer (including graphics, exhibits, stained glass, and prints), an art conservator, and a photographer. He was born in New Rochelle, New York on October 1, 1938. At 16, he won three gold key awards and a scholarship for outstanding artworks. He attended the San Francisco Art Institute in 1957, and received a Bachelor of Fine Arts from the California School of Arts and Crafts in 1961. While there, he studied painting and drawing with such well-known artists as Nathan Oliveira, Richard Diebenkorn, and George Post. His early influences were his high school art instructor who not only encouraged him to enter competitions and contests, but also provided him with art supplies and other materials. While the 1950s and 1960s saw the rise of Abstract Expressionism—represented by the popular artist Jackson Pollock’s nonobjective form and lines or emotional responses and “action” painting—Pisani chose a more recognizable and identifiable style, preferring a career in commercial art and illustration. Pisani joined the US Army in 1962, and later continued his federal service with the US Department of Defense, first as an illustrator, then as a design consultant and Art Director. Finally, as a Division Chief, he managed more than 50 artists and designers until his retirement in 1988. During his federal career, Pisani distinguished himself significantly in his field. 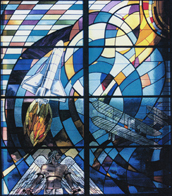 Some of his major works include a mural on permanent display at the Pentagon entitled Libertas, which was created for the Bicentennial. Another, Pershing’s Own, celebrates General Pershing who led the American Expeditionary Forces in World War I and is on permanent display at the Army Band Center in Fort Meyer, Virginia. 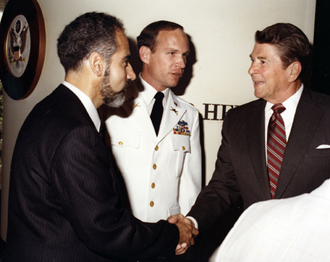 Pisani’s exhibitions also include permanent corridor exhibits at the Pentagon for Generals Marshall, Eisenhower, and MacArthur; Military Women; the ANZUS (Australia, New Zealand, United States) Treaty; Military Intelligence; and Information Management. Published paintings that include more than 24 different historical subjects and landmarks. Throughout his career, Pisani exhibited not only in the DC area but also nationwide and internationally, winning numerous awards and prizes. This success encouraged him to devote more of his spare time to fine art, specifically painting, drawing, design, and printmaking. 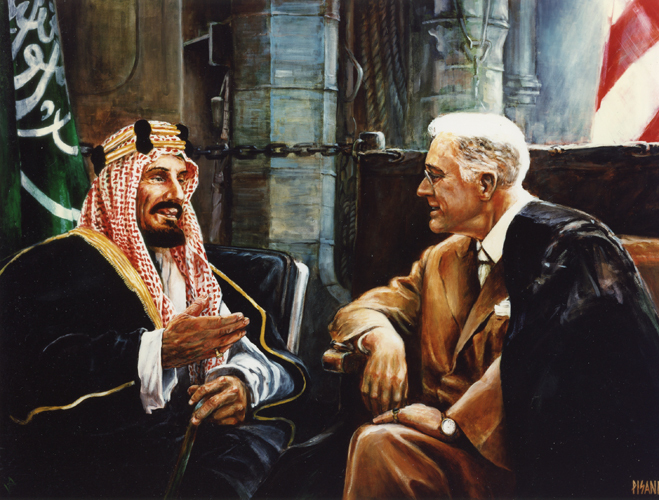 He is an accomplished portrait painter, and his portraits include such distinguished dignitaries as King Fahd bin Abdulaziz Al-Saud of Saudi Arabia; King Abdul Aziz Al-Saud pictured with President Franklin D. Roosevelt; Prince Bander bin Sultan bin Abdulaziz Al-Saud (both hanging in the Saudi Arabian embassy in Washington, DC); and Generals MacArthur, Eisenhower, Pershing, and Clark. In 1976, Pisani opened the Artist Studio Gallery. In 1988, he opened Art Gallery 101 to specialize in art restoration. In 2011, he designed and constructed the Oak Hill Studio to house his paintings, drawings, and research library. Joe Pisani’s fine artworks are included in thousands of private collections worldwide, including the United States, Italy, China, Japan, Australia, Canada, and Saudi Arabia. He is listed in Who’s Who in American Art.